It begins when a long-haul truck driver discovers a body at night, in an ominous, visually arresting sequence that sets the tone for what will follow. There’s a dark, seemingly endless highway, street signs (“Mystery Road,” “Massacre Creek”) which hint at a locale with a troubled history, and the Australian outback at dusk: the driver’s torchlight a tiny accent in the darkness. This is Ivan Sen’s third feature, following Beneath Clouds (2002), a road movie of sorts about the developing relationship between two Indigenous teenagers with markedly different desires, and Toomelah (2011), a window onto a young boy’s life in the former Aboriginal mission, with a cast almost exclusively composed of local non-actors. 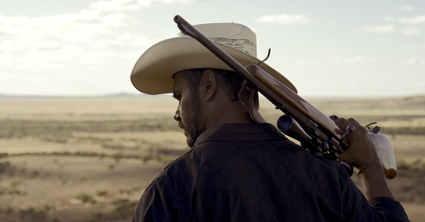 While Mystery Road occupies similar social and geographic territory to these films, it differs from them firstly in its use of a predominantly seasoned cast, and secondly in being primarily a genre work which cleaves with great respect to the conventions of the murder mystery, with its narrative lynchpins of the obstructive community harbouring a secret; the detective-outsider; and the dogged, methodical pursuit of the truth. Like the best detective stories, however, it presents us not only with a mystery, but with an unfolding portrait of a particular community and place. 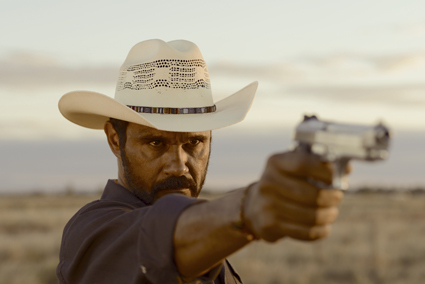 Aaron Pedersen plays the film’s central character Jay Swan, the only Indigenous police detective in his outback home town. Assigned to investigate the murder of the Aboriginal girl whose body is discovered at the film’s beginning, Jay embarks on what amounts to a one-man investigation, caught between an Indigenous population which has rejected him and colleagues he distrusts. Almost every scene in the film is a one-on-one interaction between Jay and an alternating cast of possible witnesses, suspects, family members and fellow cops (the boundaries, as one would expect, are blurred). Sen emphasises the significance of these encounters by subduing background noise to near silence, with the result that faces and voices take on an almost unnatural clarity. Every exchange is a piece of the puzzle, and the viewer is encouraged to watch vigilantly. This wouldn’t work without the committed performances of Mystery Road’s cast, an impressive concentration of Australian character actors which includes Tony Barry, Hugo Weaving, Jack Charles, Tasma Walton and Jack Thompson. Pedersen leads them in a strong, understated performance as the conflicted Jay, a contained man whose gaze is constantly wary, but who also projects sincerity and dependability. With its small-town setting, cowboy cops and a good guy in pursuit of justice, Mystery Road has more than a hint of the Western as well as the whodunnit. Visually, it’s as clearly delineated as a graphic novel, displaying a predilection for close-ups and figures silhouetted against sunset landscapes. A recurring aerial sequence shows the geometric streets of the town as Jay drives to houses of potential witnesses. Sen’s skill as an all-rounder (he was DOP as well as writer and director of the film) is clearly apparent. Where Mystery Road falls down slightly is in its function as a detective story. Every scene might be a piece of the puzzle, but not all of these pieces are put together at film’s end, particularly the portentous references to wild dogs which recur throughout but are never satisfactorily explained. Overall, however, Sen has employed the framework of the whodunnit to create a striking piece of cinema whose stylisation enhances rather than overshadows this story about a misfit cop probing a town with a rotten, racist core.